In the Sunday Times Union on February 22, 2015, Hinman Contruction was featured in the 2015 Trending report entitled “Timeless design ideas — and those whose time has passed” posted by Rebecca Landcastle. The article, included below, summarizes what is trending in the interior design and home remodeling industries this spring and includes photographs of award winning designs by Hinman Construction photographed by Mark Morand of Mainframe Photography. With remodeling your home comes endless options: flooring, countertops, fireplaces, bath fixtures — the list goes on. Some trends have had a longer shelf-life than most and promise to stick around, but there are up-and-coming products and ideas that reinforce the concept of “out with the old, in with the new” — and in some cases, it’s about making the old new again. People with busy schedules and little free time want something that fits their lifestyle. Equipped with features like glass walls and rain shower heads, showers are replacing many bathtubs, even in master suites. Walls are being taken down to open up living areas and create a better flow from one room to the next. “People just have really busy lives now, and when they are home they really want to enjoy each other,” says Paula McCormick of Paula McCormick Interiors. These open floor plans are also good for entertaining, she says. For those that want the hardwood look without dishing out the cash for it, vinyl is a viable option. It’s durable and has many different looks to choose from, making it more popular than ever among remodelers. This natural and unique stone not only looks good but is durable as well. While there are other options emerging that could steal the spotlight in the future, the hype over granite countertops isn’t likely to fade anytime soon. Although luxury baths are still being installed in master suites, traditional bathtubs are on their way out and have been for some time. “Most people tend to be shower people and they just want the space to shower,” says interior designer Denise Maurer. 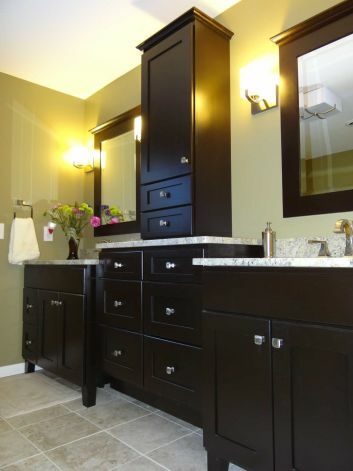 With no room for storage, many consider small powder rooms to be a waste, says McCormick. First-floor bathrooms are frequently being changed into mudrooms to better utilize the space. Bamboo is “very popular right now,” says McCormick. It grows quickly and is highly renewable, which makes it better for the environment than other choices. About 40 percent of McCormick’s customers choose bamboo when installing hardwood floors in their homes’. Although granite remains popular, many are turning toward quartz when replacing their countertops. While granite can have varying patterns and colors because it comes out of the ground that way, quartz has a more consistent finish and is just as durable. Rather than replacing cabinets to get a new look, people are choosing to reface the ones they already have. Whether using paint, stains or finishes, or putting on new cabinet doors, refacing saves you both time and money. Your base cabinets must be of good quality, though, says Maurer, or refacing probably won’t be an option. In an effort to be more environmentally-friendly, people are choosing reclaimed wood for decor such as cabinets, furniture,and hardwood floors. Aside from being eco-friendly, it’s a popular choice because it’s both sturdy and unique in appearance. Old barns are a common source for reclaimed wood. Both McCormick and Maurer describe hardwood floors as being “timeless.” More so than thinner strips of wood, wider planks are especially popular right now, from five inches and up. Although there are vinyl tiles and laminates that have replicated the look of hardwood floors, they’ll never replace them for the traditionalists who want the real thing. “Hardwood floors aren’t going anywhere,” says McCormick. With new materials and patterns, bigger sizes, and sometimes even different shapes, subway tiles are “definitely still popular,” says Hinman. Both in kitchens and bathrooms, they’ve only grown in popularity and will continue to do so.”Subway tiles are here to stay,” says McCormick. View the portfolio and read the full Trending Report article on Times Union here. If you are looking for information regarding remodeling your home, fill in the information below and we will get back to you as soon as possible, or contact us at 518-885-1835.